One of the simplest and best designed free apps you’ll find in the App Store, Speedtest.net Speed Test can tell you whether your network’s speed is up to snuff. Developed by the team behind speedtest.net (a site for testing broadband speeds), the app has an simple, elegant interface and does exactly what the name tells you it will. Launch Speed Test, and a speedometer appears with a big, shiny “Begin Test” button. You can’t resist tapping the button, and you aren’t disappointed when you do. The app immediately starts the test by connecting to speedtest.net and uploading and downloading some test files. Seconds later, you get the results. You can then compare them with previous speed tests. While Speed Test works very well, there’s still room for improvement. It would be nice to be able to create network profiles and assign tests to one profile or another. (Perhaps that’s best for a “pro” version.) And it’s a bit cumbersome to differentiate test results—say, between 3G and Wi-Fi—as you need to go to a different screen to see this and other details. But these are minor quibbles. Speed Test is sweet. 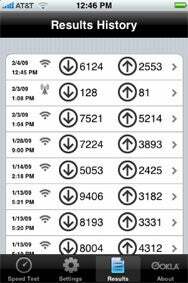 Speed Test is compatible with any iPhone or iPod touch running the iPhone 2.x software update.